Fr Patrick Bridgman of Te Awakarangi Catholic Parish begins the blessing of Greenstone Doors in Dudley St, Lower Hutt, on Sunday 2 September. 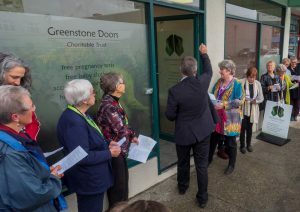 More than 60 people from Wellington and the Hutt Valley gathered on Sunday 2 September, for the blessing and re-opening of ‘Greenstone Doors’, after a month-long refurbishment and expansion of their premises in Lower Hutt. Fr Patrick Bridgman and Fr Cirilo Barlis from Te Awakairangi Parish led the procession through the building, inviting everyone to touch the walls and symbolically impart their own aroha and blessing to all who will gather there in the future. 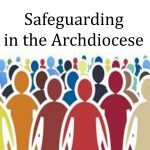 Four years ago, Cardinal (then Archbishop) John Dew opened Greenstone Doors, mainly as a pregnancy support centre. 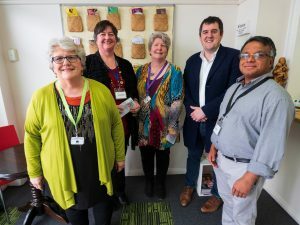 The centre has grown and has now been extended into the next-door space in Dudley St so that counselling and support groups can be accommodated. 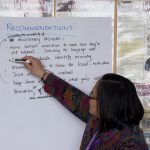 As well as free pregnancy tests and baby clothing, Greenstone Doors maintains a programme of activity aimed at connecting those who might otherwise find themselves isolated or overwhelmed by life events. 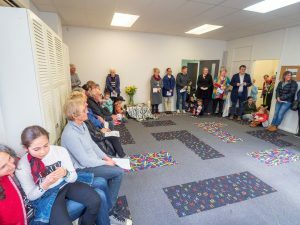 In addition to the new counselling rooms, administration and hospitality area, there is now a dedicated area for playgroups and children’s parties. A whānau room suitable for family group meetings, supervised visits and training sessions completes the new meeting spaces. According to Manager Wendy Hill, ‘These new spaces make it so much easier to manage our support groups, which cater for young parents and those looking for help through anxiety and depression. ‘Typically, people will come to Greenstone Doors for something simple ‒ either for baby clothes or to help, or to find support for themselves. 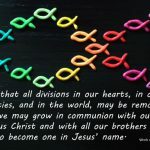 We know life can be complicated, and increasingly we are here for people who have perhaps experienced pregnancy loss or who, for whatever reason, no longer have their families together. People need time, space, sensitivity and respect before they feel safe enough to talk about other, more complex situations. Greenstone Doors Trustees with local MP Chris Bishop (l-r): Catherine Quirke, Suzanne O’Rourke, Wendy Hill, Chris Bishop MP, Aren Valentine.